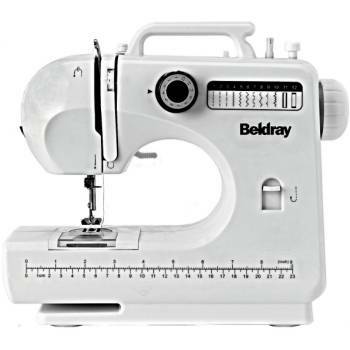 A Beldray Sewing Machine Review is difficult to find; few customer ratings exist on retailer sites and there are no independent sewing machine reviews. Limited availability consists of a few on-line European retailers that list one of two Beldray sewing machines models. Closed in 2005 after over 100 years, Beldray was known for its metalworking (brass and copper items) and later irons and ironing boards. During its years of existence, Beldray, Ltd., an anagram of “bradley,” the surname of its founder, acquired many smaller companies that manufactured a range of household goods. Although no direct information could be located about sewing machines specifically, the company did put its brand on various items produced by the companies it acquired. Presently produced by the conglomerate Martin Yaffe International, the Beldray brand exists on irons, laundry accessories and ladders and other house-wares. However, there is no evidence that sewing machines carried over. When the models were produced, who made them, the duration of manufacturing and how they came to don the Beldray name are unknown. Only listed by one major retailer, the small portable the Beldray 7 Stitch sewing machine is advertised as lightweight and ideal for “all mending jobs.” A Beldray sewing machine review could not be found on sewing machine sites, consumer reviews or in the customer comment section provided by the retailer. Users select one of the seven stitches with a dial located on the front face of the unit and control speed with a foot pedal. Additional features include zigzag stitching, control over thread tension and illuminated work area. Promoted for its ease to fix “hems, sleeves and buttonholes,” its size and minimal features are consistent with that of a machine built for a novice or young sewer. Also found on the website of European venders are two 12-stitch models. With limited consumer feedback, the Beldray sewing machine review is average at best. Note most sellers list this model as “currently out of stock,” without mention of future inventory. This unit also comes with a nylon bag, large enough for owners to tote the sewing machine and its accessories. In addition, purchase comes with a one-year manufacturer guarantee. An independent, detailed Beldray sewing machine review could not be found. However, the limited features suggest a sewing machine designed for beginner sewers or those who want a small, portable unit for travel purposes. Also sold out is the Beldray 12-stitch with accompanying sewing kit and carrying case; the free 200-piece set includes bobbins, buttons, needles, pins and other various sewing accessories. However, whether the promotion was for the ES0068 or BEL0093 remains unclear. Without a Beldray sewing machine review, potential buyers are left with inadequate information regarding the quality of a Beldray sewing product. With its limited functions, questionable availability, lack of manufacturer information and without independent reviews, the reasons to consider a Beldray sewing machine are few. Appearing more appropriate for children, young sewers or those who want to experiment, Beldray is not made with the experienced sewer in mind.